Staff Benda Bilili: Voices Of The Congo Staff Benda Bilili is a group of paraplegic street musicians who entertain from their base near the zoological gardens in Kinshasa, Congo. Benda Bilili means roughly "look beyond appearances," and those who do will find astonishing musicality and verve. Kinshasa, Congo, has long been a hotbed of earth-shaking popular dance music. The Congo sound was the disco of Africa from the '60s through the '90s — a paradox, considering the country's simultaneous descent into endemic corruption, economic ruin, disease pandemics and relentless civil war. The irony continues with the recording debut of Staff Benda Bilili, a group of paraplegic street musicians who entertain from their base near the city's zoological gardens. Benda Bilili means roughly "look beyond appearances," and those who do will find astonishing musicality and verve, as well as a good deal of insight into the intricacies of street life in a massive, decaying city. 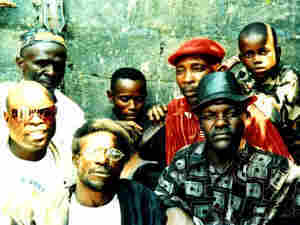 The band members consider themselves "the real journalists of Kinshasa." "Moto Moindo (Black Man)," the lead track on the band's debut CD (Tres Tres Fort), tells Africans to "wake up" to the riches around them and stop settling for a diet of "experimental chickens" and "meat made from the bark of trees." The song heats up in classic style from a sensuous rumba feel to the fervent dance groove that has made the Congo famous. With minimal percussion, the lead melody is performed on the satonge, an invented instrument constructed from a tin can, a tensed wooden bow, and a single guitar string. Its inventor and player, Roger, was 17 when this recording was made. Hearing this, it's hard not to hope that he and his band will go far.